Hey, everyone! If you’re from around “these parts,” please join us at KLRU on October 20 at 7 p.m. for our monthly Community Screening. This time, KLRU features local productions. Meet Evan Smith from Texas Monthly Talks, and see a few clips from a new independent production, Austin Daytripper. AND, meet CTG’s host Tom Spencer, director Ed Fuentes, and me. After the screening in the Austin City Limits studio, you can tour the CTG set. (And I’ll just say that on weekly ACL studio tours, some visitors race over to our set and exclaim, “Wow, it’s Central Texas Gardener!”). I like that. Can you beat last weekend’s sweetness? Sunday’s rain interfered with my to-do list, but I love that kind of interference! Despite the drought, the asters started blooming right on schedule. The yucca youngsters are still a bit overtaken, but in a few years, they’ll be the alpha plants. I took advantage of the light rain to divide some lambs ears to fill a few spots along the crape bed border. Now it’s all “connected.” While there, I couldn’t resist a picture of garlic chives against some caladiums that got their second wind. To their right, I planted three pink rain lilies (Zephyranthes labufarosea) in between my recent ‘Diamond Frost’ euphorbias. In the middle of the bed, white Salvia coccineas are overwhelming the dianellas, but I like the ethereal look. It’s not worth taming them now, since it won’t be long before they’re history. After the first hard frost, the dianellas will be back in control. I never need a calendar to know it’s fall. Along with the asters, under the Chinese pistache, Salvia regla announced it. So did Mexican mint marigold (Tagetes lucida) and Gregg’s mistflower (Conoclinium greggii) in the cat cove. 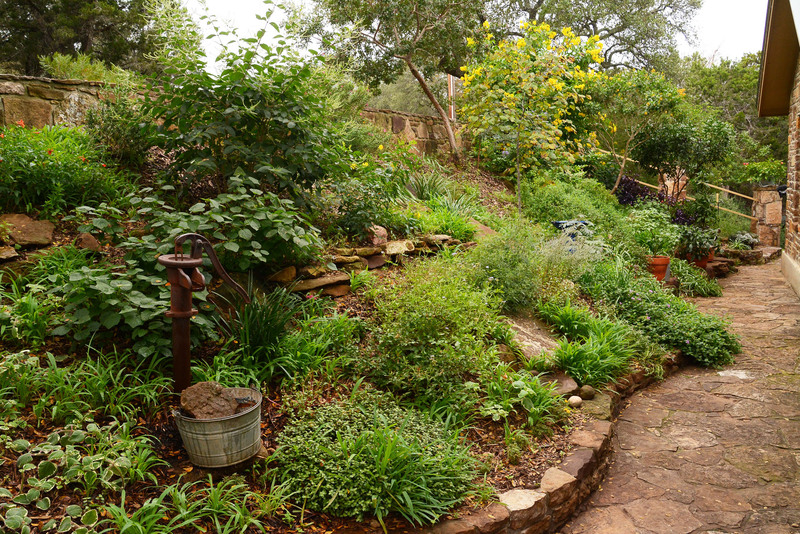 On CTG this week, take a look at the really fabulous Travis County Master Gardener tour, coming up October 24 from 9 a.m. – 4 p.m. Thanks to Loretta Fischer for providing images of these outstanding, hands-on gardens. This year’s theme is Sustainable Gardening for Urban Wildlife. At each garden, meet the gardeners and ask them how they made it through summer, and how they attract wildlife. On top of that, each garden features seminars for tips on plants, wildlife, and garden problems. And of course, they’ll have plants for sale! It’s only $10 for the whole shooting match or $5 per garden. Get all the details here. On CTG’s video tour, we take our camera to one of them to illustrate how Lindy McGinnis turned her front yard into a garden that attracts both wildlife and the neighbors. If you miss the broadcast, or want to get ideas from afar, including John’s how-to on the EarthBox, watch it starting Friday night at KLRU.tv.